It is rare that a particular stock market support level becomes as obvious as 2,040 for the S&P 500. Since March 18, the S&P touched 2,040 +/- 13 times, and bounced every time. As of 2,040 wasn’t already obvious enough, it also became the neckline of a head-and shoulders topping pattern that got a fair amount of attention. Barron’s rates the iSPYETF as a “trader with a good track record.” Click here for Barron’s assessment of the Profit Radar Report. Technical analysis supported the notion of a seesaw across 2,040. 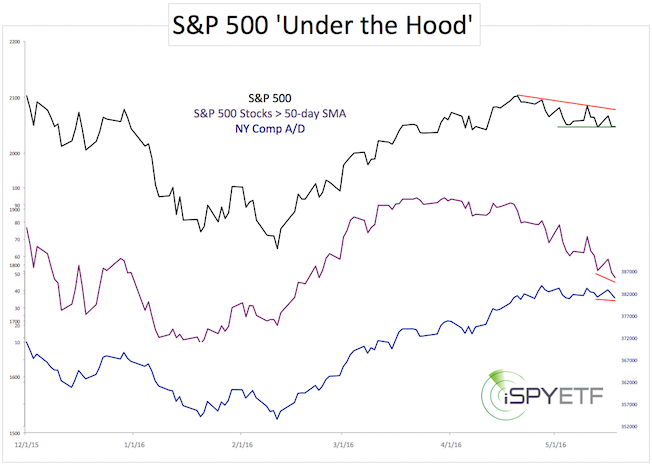 On one hand, there was a bearish divergence between the S&P 500 and two different breadth gauges shown below. On the other hand, there was the potential for a bullish RSI divergence on the hourly chart. The Profit Radar Report anticipated a break below 2,040 (due to the bearish divergence), but did not recommend to chase the down side, due to the propensity for a seesaw and the bounce-back potential suggested by the bullish RSI divergence. Sometimes it’s just best to stand aside while the market tries to fool the crowded trade(s). Now, that the market has punished bulls with a stop-loss near 2,040 and bears who went short on a break below 2,040, it may be ready for its next move. Resistance (and an open chart gap) is just around 2,065, and we know for sure where the next support is, or do we? 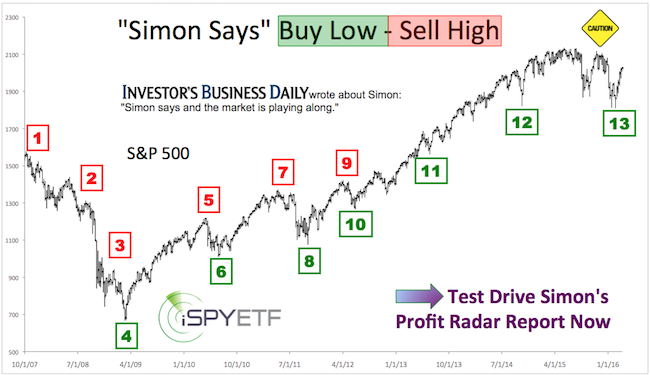 Continued S&P 500 analysis is available via the Profit Radar Report. The S&P 500 is now below key support. Regardless of the exact shape and scope of the decline, this puts the bears in the drivers seat until further notice (= break above resistance, or bullish divergence against support). 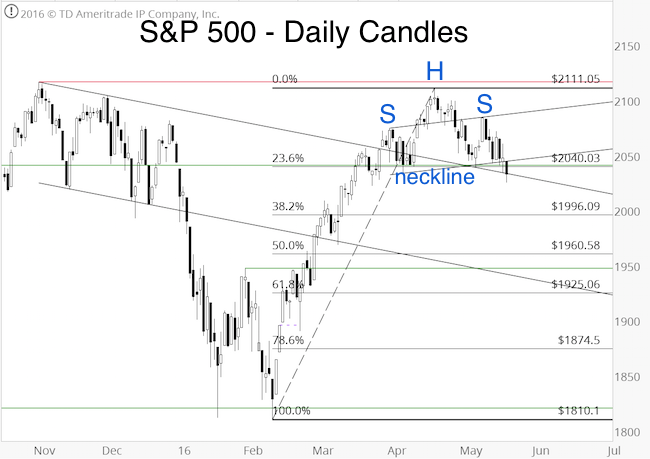 There is a real chance the S&P will continue to follow the projection featured in the April 13 Profit Radar Report, also published here. At the end of last week we saw some excessive pessimism (reported here), now we are seeing signs of complacency. 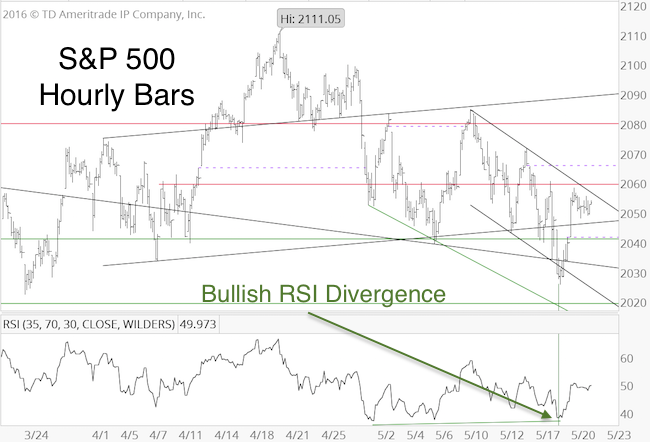 The S&P 500 rallied and closed the open chart gap on Tuesday (May 10). This open gap was our minimum up side target, and the fact that the S&P turned lower immediately after reaching the target indicates persuasive selling pressure. On the same day, the VIX:VXV ratio dropped to 0.79. Wednesday’s (May 11) Profit Radar Report explained what this means. 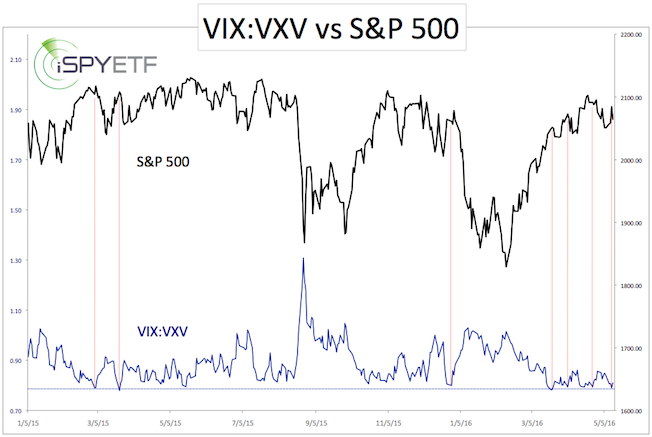 “The chart above plots the S&P 500 against the VIX:VXV ratio. The VIX measures implied volatility for the next 30 days, VXV for the next 90 days. Readings below 1 mean that option traders anticipate 90-day volatility to exceed 30-day volatility. Readings below 0.80 indicate extreme complacency towards short-term volatility. Yesterday’s reading was 0.79. As the dashed red lines indicate, sub 0.80 readings have consistently led to a pullback, although the scope of any pullback varies. This indicator was the reason we did not want to chase yesterday’s spirited rally. Today’s S&P 500 reversal after closing the open chart gap yesterday neutralizes (and reverses) the bullish edge discussed on Sunday. The S&P remains in the chop-zone with 2,065 being the likely ‘line in the sand’ between short-term bullish and bearish moves. Once the S&P reaches the initial down side target, we’ll evaluate our dashboard of indicators to see what’s next. Continued S&P 500 analysis is available via the Profit Radar Report. There hasn’t been a truly noteworthy investor sentiment extreme since the January/February lows, when the Profit Radar Report recommended buying. Last week saw some unusual sentiment readings. “Some measures of sentiment are in unusually bearish territory. Unusual considering that the S&P just traded only 1% away from its all-time high! 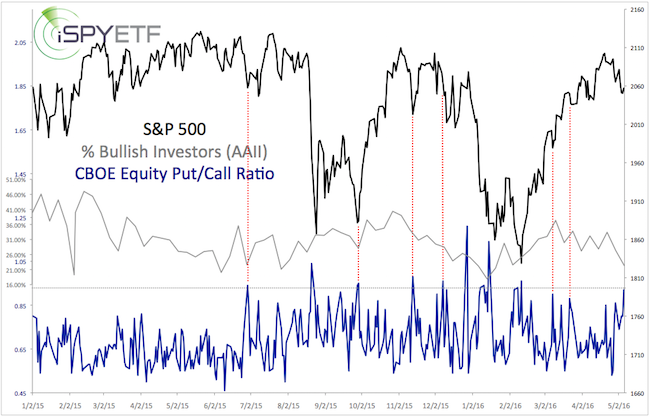 Shown below are the % of bullish investors (polled by AAII) and the CBOE equity put/call ratio. In addition to these ‘odd’ sentiment readings, various indexes reached support levels. The S&P 500 is within striking distance of the open chart gap (2,079.12), we we’ll have to evaluate if this bounce ‘has legs’ or not. Since late December 2015, when we anticipated a tradable low, gold has rallied as much as 25%. Commercial hedgers (considered the ‘smart money’) are now heavily selling into this rally. 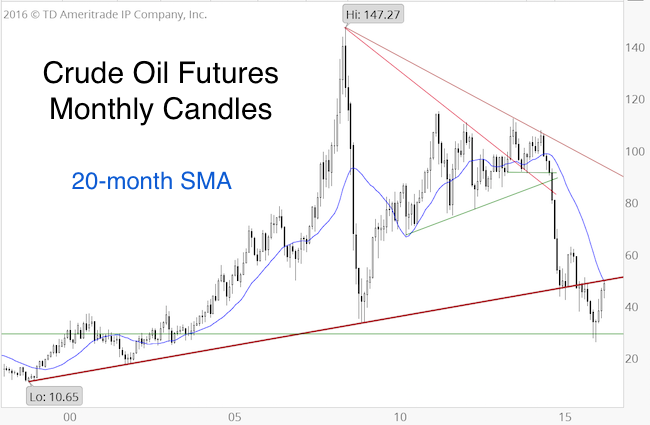 The chart below was published as part of the April 24 Profit Radar Report update. Shown is the price of gold along with the net exposure of commercial gold hedgers. Hedgers have racked up the largest short position since 2012. As the updated gold chart shows, gold reversed just below the 1,310 – 1,320 zone, but remains above support. 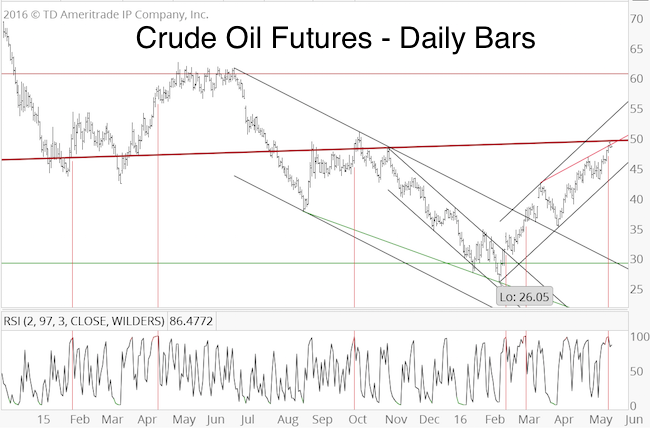 What this means is discussed in the latest Profit Radar Report update. 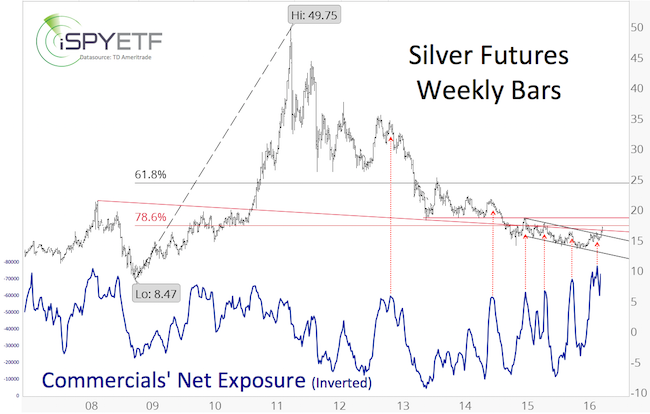 The chart below (published via the April 20 Profit Radar Report) shows that commercial hedgers are even more bearish on silver. 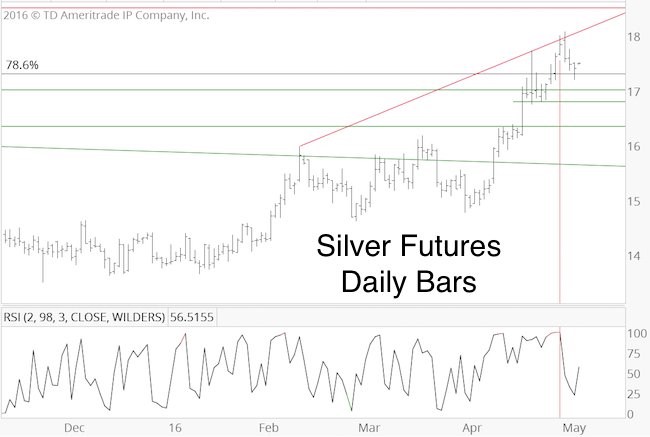 The updated chart below shows silver reacting to its overbought condition and rising red trend line, but reversing before reaching resistance at 18.5. 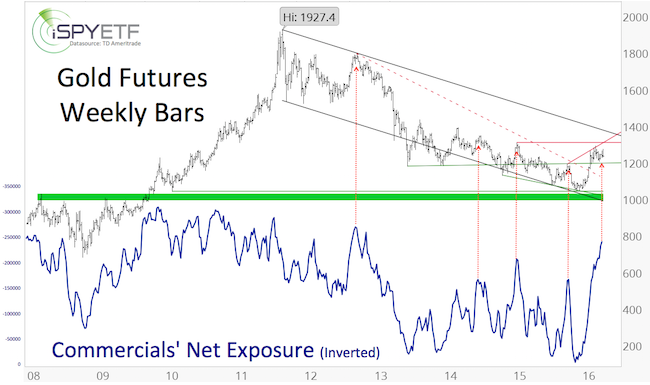 The extreme short positions of commercial hedgers and the most bearish seasonal pocket of the year should be a worry for silver bulls, but may set up a nice trade for trading opportunists. 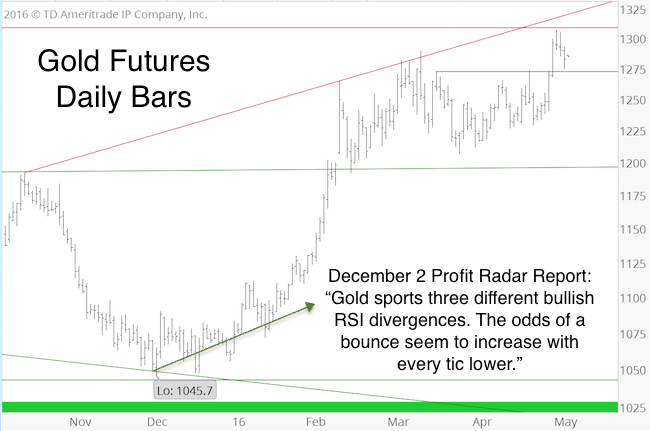 Continued gold and silver analysis is available via the Profit Radar Report. 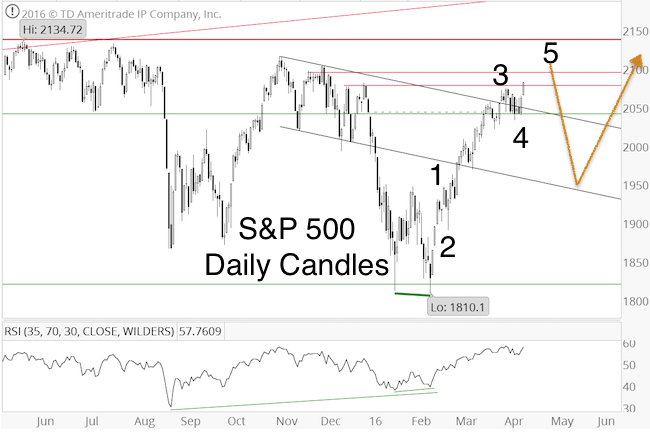 S&P 500 Update – Two Cookies Now? My worst fear when I first started analyzing markets and publishing my research was FOMO. Fear Of Missing Out … on the next big move. This was reflected in my market forecasts, which were either full speed forward (prices will soar) or full speed reverse (market will crash). True, this kind of mentality helped me peg the 2007 top, and the March 2009 and October 2011 bottoms, but it takes more than an ‘all or nothing’ approach to succeed at investing. Today I rely on dozens of indicators that fall into one of four categories: 1) Supply & demand 2) Technical Analysis 3) Investor Sentiment 4) Seasonality & Cycles. The result is a more balanced, comprehensive and potent signal, along with the realization that the market may be stuck in neutral for a while. There are times when indicators conflict and essentially cancel each other out. More often than not, trading during such times is like forcing the round peg through the proverbial square hole. On Wednesday, May 4, the S&P 500 dropped to 2,046, which was also the March 17 high. In essence, the S&P 500 hasn’t gone anywhere for the last 33 trading days. Looking back, it now makes sense why our indicators haven’t given us a S&P 500 signal (and why the Profit Radar Report hasn’t recommended a S&P 500 trade) since March 17 (when we closed out the S&P 500 position bought at 1,828). It’s almost been a month since the last complimentary S&P 500 update (April 11: S&P 500 Stuck in Resistance Mud). It’s not because I’ve gotten lazy, but there just hasn’t been much to update. 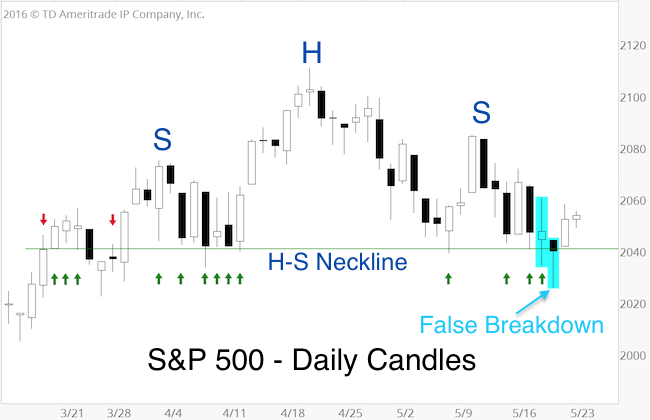 The concluding comment of the last April 11 S&P update was that: “Our indicators stopped providing a cohesive directional signal when the S&P first hit 2,040. In hindsight, this explains the trading range since. Unfortunately, there is still no cohesive directional signal. “Support at 2,040 held and the S&P 500 moved higher today. Looks like the short-term bullish wave 4/wave 5 scenario discussed on Sunday is in play. This means, that the S&P 500 is likely to continue a bit higher, before embarking upon a deeper (but temporary) correction. Thus far, the S&P topped and reversed at 2,111.05 on April 20. 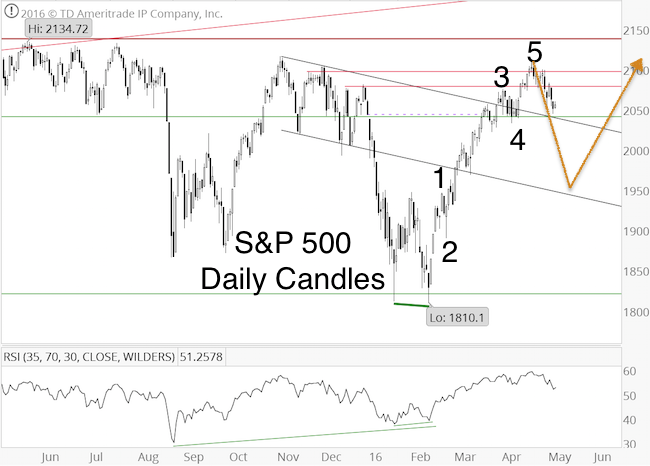 It is possible that the S&P is following the projected yellow path.